Please note this property has no reception, therefore, it is compulsory to arrange a time to collect the keys to your apartment. We kindly ask you to contact us at least 24 hours prior to the check-in date. The keys will only be given to the booker following verification of photo identification and after full payment for the accommodation and damage deposit has been received. In the heart of the vibrant North city centre and close to all major transport links, Five Lamps Suites offer luxury short-stay accommodation sleeping from 1 to 6 persons per suite. All suites are furnished to a high quality standard, providing all the home-from-home comforts you will need. Each suite has a well-equipped kitchen with fridge, freezer, cooker, oven and microwave. All utensils including crockery, cutlery, pots and pans, hairdryer, iron and ironing board are provided and on-site laundry facilities are available. Five Lamps suites feature a spacious open-plan kitchen/dining and living room, 1-2 generous bed-rooms with king-size bed and a luxury bathroom. The lounge area contains a comfortable couch and armchair, coffee table, sideboard and 32″ LCD television with 60 cable channels. High speed wireless internet is also provided free of charge in all suites. All bedrooms have a king-size quality bed, large wardrobe and chest of drawers/dressing table. The modern bathrooms have a combined bath and power shower. Bed linen and towels are provided and are changed weekly/daily (extra charge for daily service). Our suites are spaciously designed to accommodate up to 6 people per unit. On-street paid parking is available in the surrounding area; however, given the central location of Five Lamps Suites, a car is not required. Special business/corporate rates are available for longer stays. Five Lamps Suites are located at the junction of Amiens Street and North Strand Road, in the heart of Dublin city centre. 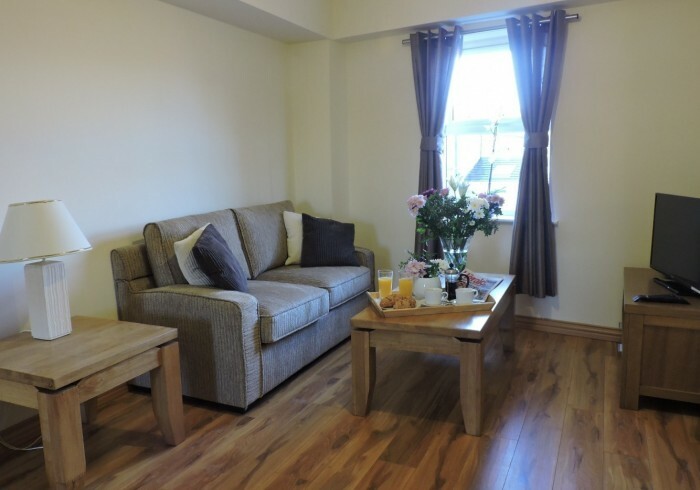 Five Lamps Suites are ideal for business and leisure travelers as they are within walking distance of airport and country transport links – 5 mins walk to Connolly train station and Bus Aras depot, and Aircoach/Airlink bus. Address 1: 5/6 North Strand Rd.